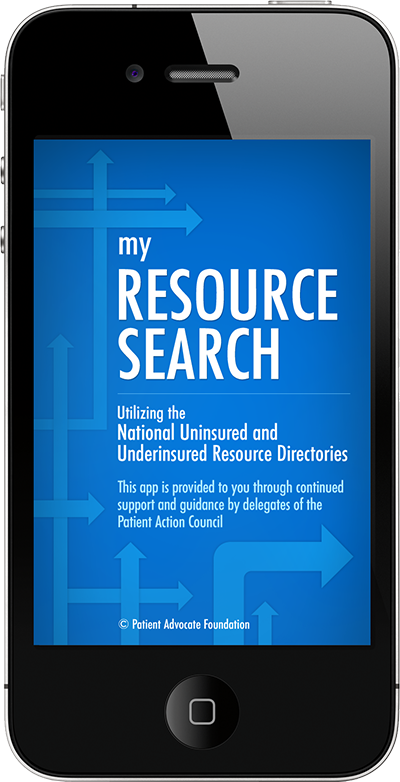 Harnessing the power of the National Uninsured and Underinsured Resource Directories, My Resource Search allows both insured and uninsured patients the ability to quickly identify the community, national and charity programs that can assist in their healthcare needs. My Resource Search is perfect for patients currently experiencing a health crisis, or providers who want to guide their patients to programs that may be able to reduce their barriers to care. Generating a list of assistive programs is as quick as 1 – 2 – 3 – 4 by answering only four simple questions. By offering over 35 assistance categories to choose from, patients can quickly narrow resources to those that offer the exact help they need — including options like screening services, insurance policy options, financial assistance for housing, utilities and transportation, clinical trial or medication assistance. This app offers easy one-touch access to professional case managers for individual support and solutions to healthcare barriers. The app provides direct and free access to the published tip booklets for the uninsured or underinsured patients written by expert case managers at Patient Advocate Foundation. My Resource Search is for patients in all states facing a challenging medical diagnosis.